Angels and aliens alike figure in this metaphysical SF novel from proto-cyberpunker Shirley (Heatseeker), who here throws UFOs, black helicopters, several major biblical figures and spiritual transcendence into the early 21st century. The U.S. has splintered into warring racial, religious and ethnic enclaves, and the federal government, vainly trying to hold things together, has become enormously repressive. As the novel opens, a public relations man is blackmailed into accepting employment at a secret government installment near Roswell, N.M. There, he discovers that most of the standard UFO myths are in fact true. There's not only a flying saucer at Roswell but a live alien as well, one who loves hot chocolate and cigarettes. And he isn't so much a prisoner as an ambassador. Unbeknownst to the president or congress, secret elements of the U.S. government have been working with the aliens for decades, ostensibly for the betterment of humankind though there are early hints that the aliens, called Zetans, have ulterior motives. Readers soon learn that two separate alien races have visited the Earth. The Zetans are, it seems, in conflict with the Meta, and the PR man has been hired to make the Meta look bad. Fans of politically conservative hard-SF may be turned off by Shirley's stereotypical characterization of the military, his brief and rather nasty send up of two popular right-wing SF writers and his metaphysical climax. 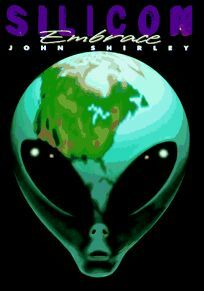 But it's clear that the author is having fun tying together disparate UFO, conspiracy and New Age myths; readers will have fun watching him do the tying, too.